Producing 10L/Day of liquid nitrogen on site these generators remove the hassle and reliance on external suppliers to provide you with your liquid nitrogen needs. 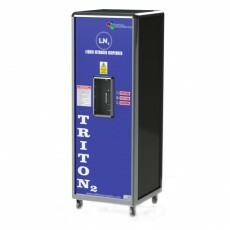 Generate Liquid Nitrogen on site with the Triton Liquid Nitrogen Generator. Place next to your application and simply plug in and press start removing the need for costly and inconvenient deliveries of liquid nitrogen. The technology has huge implications for industrial, medical, cryopreservation and laboratory applications, removing the need for liquid nitrogen tanker deliveries and transportation of LN2 between floors and department buildings. Risk of asphyxiation in elevators is dramatically reduced if the liquid nitrogen is generated in close proximity to the application. The control system used gives operators all the information necessary to ensure an efficient and consistent supply of liquid nitrogen. Making laboratory life easy.